Columbus, OH Author Belinda Kroll teams with Ava Misseldine of Sugar Inc, local gourmet tea and cupcakes, to celebrate the release of her newest book Haunting Miss Trentwood. Oct. 21, 2010 - PRLog -- Author Belinda Kroll teams with Ava Misseldine of Sugar Inc, local gourmet tea and cupcakes, to celebrate the release of her newest book Haunting Miss Trentwood. Kroll and Misseldine have selected gourmet tea blends that represent the main characters of Haunting Miss Trentwood. The book launch tea tasting party is sure to be a fun event for book, tea, and cupcake lovers of all ages. The event will be held at the main branch of the Columbus Metropolitan Library on Grant Street. Clear your calendar for the event on Wednesday, October 27, 2010 at 6:30 PM. Kroll will be there with book copies available for purchase and signing. Haunting Miss Trentwood is set in the 1887 English countryside and follows the story of Mary Trentwood, a grieving woman who sees the ghost of her father crawl from his grave during his funeral. This unexpected moment sets in motion events that hint at blackmail, betrayal, perhaps even murder. Kroll utilized the micro-funding community Kickstarter to encourage readers to get involved with the production of the book. The book launch and tea tasting party is meant to celebrate the release of the book and recognize the fifty backers who helped make the book happen. 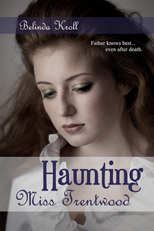 To learn more about Haunting Miss Trentwood, visit the author's website at http://worderella.com. Bright Bird Press is a micro-press working with self-publishing authors to develop, produce, and market their books.